I thought I’d share a photo from when I was little today for Flashback Friday. 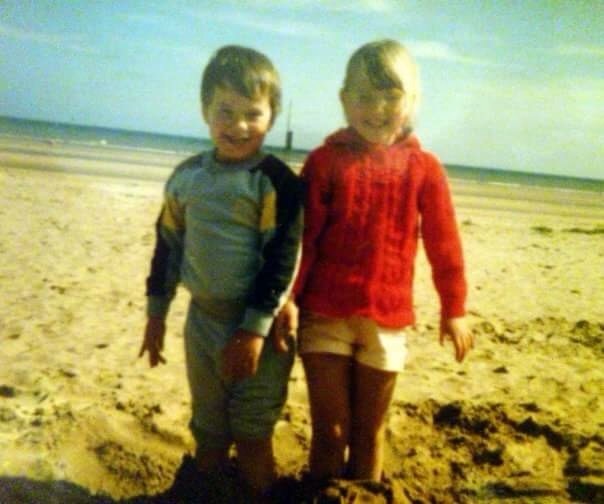 This photo was taken on a beach in North Wales, I think, probably Rhyll. I’m standing with one of my best friends when I was young – Andrew. I’m wearing a cardigan knitted by my mum. My mum used to knit jumpers for me and my brother. They were ace! She did one with a pony on with a 3-d type mane. My mum knitted a couple of cardigans not too long ago and they were like wearing a cuddle. So lovely. When I was young I wore these massive thick lenses in my glasses. I don’t even wear spectacles now, but no I didn’t go to Optical Express, I’ve no idea what happened; I just don’t need them now. And you can see where James and Noah get their blonde hair from. My hair was blonde until I was about 12 and it started going streaky. Now I’ve brown hair with just a few natural highlights caused by the Egyptian sun on our recent holidays. Fabulous photo I remember having a cable knit cardy too they were all the rage. I hope you will add this to my link flashback Friday too.